Create new portal General / Continue to Database server Database server / Select Oracle / Click on "Next"
Portal menu / Portal properties Database / Port database Database server / Select Oracle / Click on "Next"
A new Intrexx portal must be created with a new user/schema. An existing user/schema is used for this portal. With this option, the connection URL will be automatically composed of the entries in the Database server and Service fields. With this option, the connection URL can be edited directly, for example for a connection to Oracle RAC. Please consult Oracle for the correct connection parameters of your connection URL. Enter the hostname of the computer where the database server is running - such as localhost or MyCentralServer. 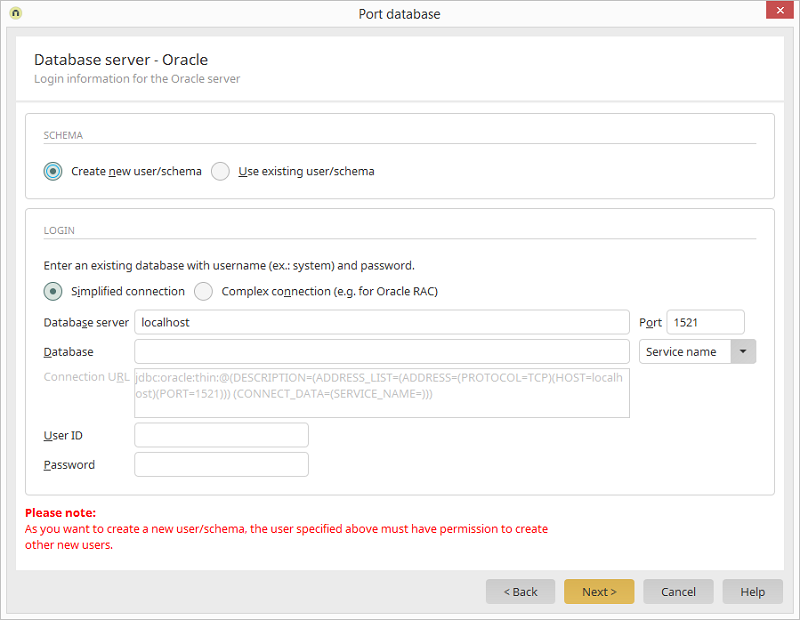 The Oracle DBMS normally uses port 1521. If your Oracle server is running on a different port, please enter it here. Enter the name of the database. Select whether this is a service name or SID in the drop-down list to the right. The connection URL is automatically generated from the parameters entered in this dialog. Under User name/Password, the login data for an existing user will be entered who possesses the rights to create a new user/schema.